The fabric you are referring to also appears in the famous National Portrait Gallery portrait of her. It may be a coif, a cap worn under the hood, which were often decorated with the pleated pattern. Coifs were used to provide extra warmth, keep hair out of the face, as protection from the elements. Without a hood, a coif could be worn for modesty reasons, to keep the head covered. The French hood was quite daring for its time, when it was considered somewhat risque for a woman to not have her hair covered fully. Under the hood, they looked stylish, with the distinctive pleats. 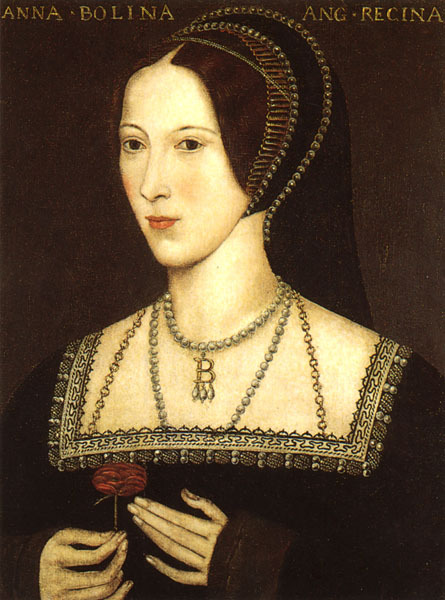 A coif may have made it easier for the hood to stay put on the head until the advent of the chin straps seen in later portraits, such as the one of the "lady in black" who was first identified as Katherine Howard but is now thought to be Jane Seymour's sister Elizabeth, daughter-in-law of Thomas Cromwell. The pleated material could also have been a crepine, kind of like a head band, to keep the hair out of the face. Or the pleats could have just been the inner lining of the hood itself, but the pleats peeping out for fashionable effect. Hi Elizabeth, thanks for replying, but are you refering to the edge of gold that appears from underneath the hood? That I know does appear in all the french hood pictures of Anne. 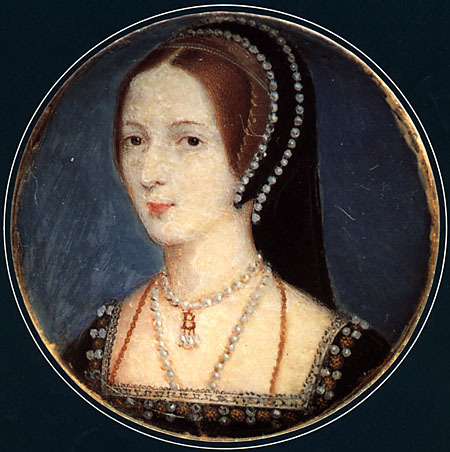 However, the Hever and Hoskins pictures have an 'added' component. It looks like a headband or edging of gauze that goes across the front of the head above the hairline. You will have to specifically see the Hever of Hoskins portraits to see it. The NPG version does not have it. The band looks to me like a device intended to keep the hood fixed in place on the head. The hood sits so far back on the head that it cannot have had much to "grab on to," so the device, which looks to me like a cord of braided gold thread, gripped the front of the head and kept the hood from sliding off the back, maybe?